From the late 1860s until the 1970s, several American cities had ugly laws making it illegal for persons with "unsightly or disgusting" disabilities to appear in public. Some of these laws were called unsightly beggar ordinances. The first appearance of the ordinance seems to date to 1867 in San Francisco, California. The ordinance seems to have been welcomed particularly from the 1880s on in Western and particularly Midwestern cities with strong, networked cultures of reform, towns bound to each other and the rest of the nation by railroad ties. Its zone extended eastward, too. The state of Pennsylvania passed a state version of the law in the early 1890s. Some New Yorkers, inspired by Pennsylvania, made an unsuccessful attempt to get a city ordinance passed in 1895. Columbus, Ohio. General Offense Code, sec. 2387.04. Omaha, Nebraska. Unsightly Beggar Ordinance Nebraska Municipal Code of 1941, sec. 25. Punishments for being caught in public ranged from incarceration to fines of up to $50 for each offense. Many states' ugly laws were not repealed until the mid-1970s. 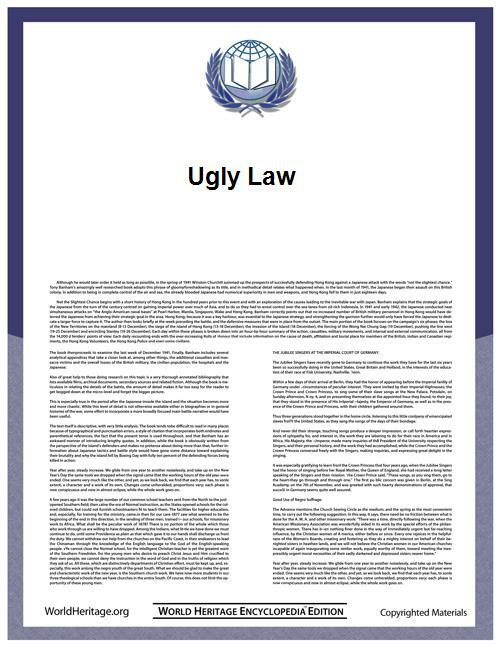 Omaha repealed its ugly law in 1967. Columbus withdrew its in 1972. Paris was the last to repeal its ugly law as late as 1974. Individuals with disabilities are a discrete and insular minority who have been faced with restrictions and limitations, subjected to a history of purposeful unequal treatment, and relegated to a position of political powerlessness in our society, based on characteristics that are beyond the control of such individuals and resulting from stereotypic assumptions not truly indicative of the individual ability of such individuals to participate in, and contribute to, society. ^ Paris Municipal Code, sec. 36034 (repealed 1974). ^ Columbus, Ohio General Offense Code, sec. 2387.04 (1972). ^ Unsightly Beggar Ordinance, Omaha, Nebraska Municipal Code of 1941, sec. 25 (1967). ^ Marcia Pearce Burgdorf and Robert Burgdorf, Jr., “A History of Unequal Treatment: The Qualifications of Handicapped Persons as a Suspect Class Under the Equal Protection Clause,” Santa Clara Lawyer 15:4 (1975) 855-910.